Painting the interior of your home can be stressful if you don’t have the right experience and equipment. That’s why many homeowners choose to hire professional interior painters in Toronto. These services can actually be more budget-friendly than painting on your own, because they are a packaged deal and you won’t need to pay for paint or tools or have to miss time from work. The painting process can be messy and tricky, which is why it’s a great idea to ask the pros for help. Here are 10 reasons why you should hire an interior painter. Professional interior painters bring their years of experience to every job. They have the tools, equipment, techniques, and processes to ensure your project is completed in a timely, high-quality, and efficient manner. They know all the steps involved in a painting job, such as how to prepare surfaces, how many coats of paint are needed, and how to set up the environment for faster drying. When you hire a professional painter, you can trust that they will do a high-quality job because they have access to the right tools and materials. They will know which tools to use and have them on hand, such as brushes, sprayers, rollers, drop sheets, protective tape, etc., so you won’t need to spend extra money on supplies. All you pay for is the service, and they will handle the rest. They will also make sure the job is done safely by bringing ladders or other equipment to reach high places that you may not have, and would be challenging to reach on your own. Safety is extremely important, even for seemingly easy painting projects. An established professional will reduce the risk of hazards and dangers because of their techniques and practice. When you leave the job to them, you won’t need to risk climbing ladders yourself or be exposed to any chemicals used in the painting process. Another huge advantage of hiring professional interior painters is knowing they use the best products. Since they do this for a living, they will know the best paints and tools to use and can provide you with insight into which brands are the best for each painting project. When it comes to interior painting, every brush stroke or roll counts. Even tiny speckles of hair or dust can get caught in the tools and end up causing ridges and imperfections in the paint. The colour of paint you choose at the paint store may not look the same under your indoor lighting. There are so many details to consider when painting your home, which is why it’s a great idea to hire professionals instead. They are aware of these details and concerns and can ensure the result is picture perfect. Professional painters understand the value of time, so they work as efficiently as possible until the job is finished. Companies that provide these services will provide as many workers as necessary to ensure the job is done in a timely manner, so you can get back to enjoying the space. Without the right know-how, tools, and personnel, a painting job could take you many days, but professional painters have all the required elements to ensure a quick job. One of the tedious aspects of painting your own interiors is the cleanup process. Paint smudges on your trim, accidental spills on the carpet, and a set of clothes you can never wear again are just a few of the messes associated with DIY interior painting. The good news about professional painters is they will protect your furniture and ensure that there won’t be any paint splatters or messes on your valuable items. They will remove items off your walls, take down curtains and blinds, remove outlet covers, and more to ensure only the walls are painted. Hiring professional interior painters can put your mind at ease, as you won’t need to think about taking time off work or filling your weekend with painting. You can spend that time doing anything you want, while they handle the painting for you. Painting your own home can also be stressful, as you may wonder if you’re doing the right job. A team of professionals know the ins and outs of interior painting, so you can have peace of mind knowing you’re getting quality work. Painting your interiors requires more than just paint and brushes. Although changing the colour of each room may be your goal, you may also be considering how to raise the value of your home when it comes time to sell. When you work with a professional team, you will get the advice and quality work that will increase the value of your home. 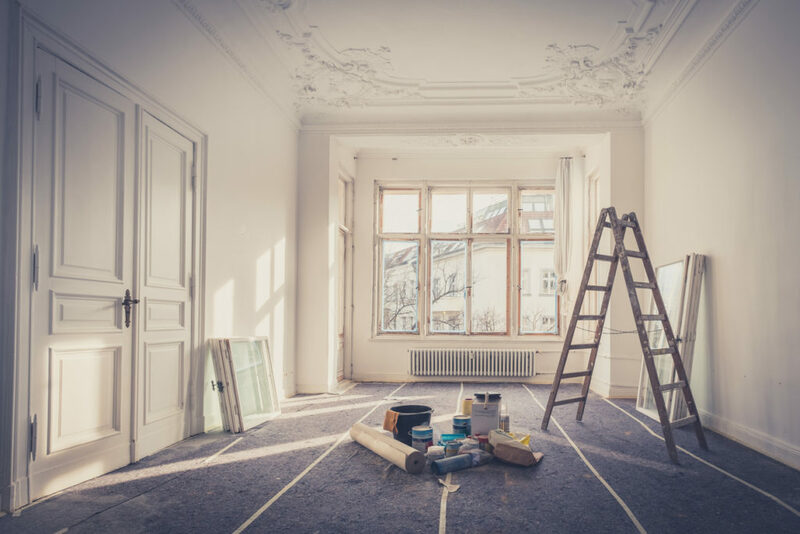 You will also be working with licensed professionals, who can provide you with insurance if any accidents do occur during the painting process. When you hire an interior painter, you get more than a professional to recolour your walls. Interior painters are skilled and understand how lighting affects the colours you want. They will be able to provide you with insight and advice on which colours work best in each room. They can also help you decide on which hue complements the décor of each room. A professional painter will take care of all these concerns so you can rest and enjoy the refreshed look of your new home once the project is complete. Professionals guarantee quality work, which can relieve a lot of pressure you may otherwise place on yourself to repaint. If you’re looking for interior painters in Vaughan, Booth7 can help. We are your one-stop shop to give your home a fresh new look and style and help you help make wise, affordable decisions about updating your spaces. Our services also include free in-home consultation, colour designer consultation, competitive pricing, and custom designs. We handle all the details of your project from start to finish, so you can trust you are in good hands! To get started on your home renovation or painting project, call Booth7 today! Fill out our online form or contact us at info@booth7.com and our staff will respond to your inquiry within a few hours.